Calcium is essential for all living organisms, where Ca2+ sequestration and release into and out of the cytoplasm functions as a signal for many cellular processes. 99% of calcium is found in bones and teeth with the remaining 1% found in the blood and soft tissue. Serum calcium levels are tightly controlled (8.4-11.4 mg/dL) and any variation outside this range can have serious effects. Calcium plays a role in mediating the constriction and relaxation of blood vessels, nerve impulse transmission, muscle contraction, and hormone secretion. Calcium ion channels control the migration of calcium ions across cell membranes, permitting the activation and inhibition of a wide variety of enzymes. Causes of low calcium levels include chronic kidney failure, vitamin D deficiency, and low blood magnesium levels that can occur in severe alcoholism. 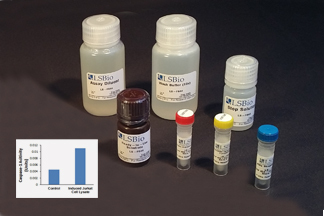 The Colorimetric Calcium Assay Kit utilizes the chromogenic complex (? = 575 nm) formed between calcium ions and 0-cresolphthalein to provide a simple assay in the physiologically important range of calcium concentration 0.4-100 mg/dL (0.1-25 mM). The kit can detect calcium concentration 0.4-100 mg/dL (0.1-25 mM). Shipped +4°C Ice Packs, Store at Store at 4°C for up to 6 months., 12 months shelf life.